If you fancy your Ultimate Guide to Tarot in a condensed, clever split-page format, here you go! It’s full colour throughout and spiral bound, and those split pages mean you can pair up a card interpretation with a spread. The information within is the same as The Ultimate Guide to Tarot – this is an alternative format, and will be particularly helpful if you’re learning to read cards for the first time. I’m loving this little vid from my friends at Fair Winds, US – the publishers of Tarot Made Simple, which is hot off the press. So easy to see how the book will work. 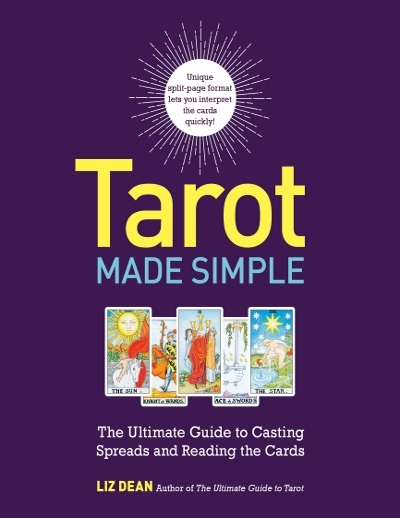 It’s a clever composite of my Ultimate Guide to Tarot and Ultimate Guide to Tarot Spreads – you get the best of both in a spiral-bound, split-page format, so it’s great for beginners and of course, tarot teachers.